University of Notre Dame campus. 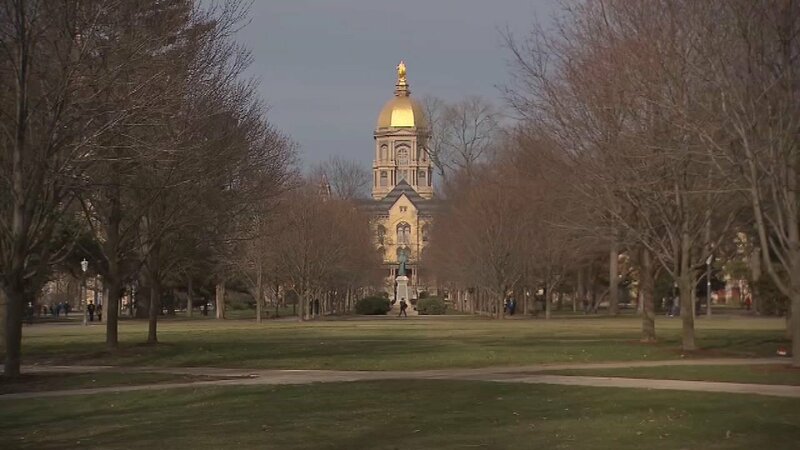 NEW YORK -- Less than a month after the Trump administration weakened Obamacare's contraceptive mandate, the University of Notre Dame announced it will stop covering birth control for students, faculty and staff. The Catholic institution, which had long battled the Obama administration over the mandate, will end coverage of contraceptives for employees after Dec. 31. Students, whose insurance follows the academic calendar, will lose the benefits after Aug. 14. "The University of Notre Dame honors the moral teachings of the Catholic Church," the University Health Services director wrote to students in an email last week. "To comply with federal law, Aetna Student Health has provided coverage, separate from University coverage, for additional women's health products or procedures that the University objects to based on its religious beliefs." Under Obamacare, insurance plans had to cover contraception for women without charging a co-pay. Over 55 million American women have had access to birth control coverage with zero out-of-pocket costs, according to the National Women's Law Center. A fairly limited number of employers -- mainly churches and some other religious entities -- could get an exemption to the mandate. Some other employers, such as religious-based universities or hospitals, could seek accommodations so that they didn't have to provide coverage, but their workers could still obtain contraceptives paid for by the insurer or the employer's plan administrator. Notre Dame's students and workers received coverage this way. The Trump administration, however, issued new rules last month that would let a broad range of employers stop offering contraceptive coverage through their health insurance plans if they have a "sincerely held religious or moral objection." Notre Dame is one of the first employers to take advantage of the increased leeway. Its president, Rev. John Jenkins, applauded the administration's decision last month, saying "no one should be forced to choose between living out his or her faith and complying with the law." The university had filed lawsuits seeking relief from the contraceptive mandate in 2012 and then again 2013. The tables have now turned, with the American Civil Liberties Union filing a lawsuit against the Trump administration last month that challenges the new rules. One of its clients, Kate Rochat, is a law student at Notre Dame. "While not surprising, Notre Dame's move to block access to affordable contraceptive coverage is deeply disappointing," said ACLU Staff Attorney Brigitte Amiri. "We have already taken legal action against the Trump Administration because our client Kate Rochat and the thousands of other women affected by this decision should not have their access to basic health care services denied simply because of where they work or go to school." Some Notre Dame students are also protesting the university's decision. The Graduate Workers Collective of Notre Dame, an independent group of graduate students, held a rally last month and just started circulating an online petition demanding the administration re-examine the move. "The health of people at Notre Dame who can become pregnant, especially those who are low-income, will be jeopardized by obstructed access to reproductive care," the petition reads. "Meanwhile, University representatives are citing religious liberty as the rationale for a policy which is in fact discriminatory. The University's position is philosophically incoherent and morally untenable." Kate Bermingham, who is pursuing her PhD in political science at Notre Dame, said she depends on the free coverage for birth control pills and contraceptive counseling. The graduate student stipend is only $23,000 a year, she noted. "We shouldn't be materially disadvantaged because we have women's bodies," said Bermingham, 28, who chose Notre Dame because of its strong political theory program.